Serbian History 101 - Welcome! Dobro Nam Dosli! "Hello!" WELCOME to my website! I hope you find it interesting and enjoyable! St. Elijah Serbian Orthodox Church in Aliquippa, PA 15001, which celebrated its 103th Anniversary on August 2, 2017. There's so much to see and read, you could study this website for days. Be sure to look on the left-hand side for site information that interests you, and then click on it to open that page. You can always return to learn more from the other selections too! Their Past, Present, and Future! This website hopes to Preserve Serbian heritage, culture, traditions, history and music. This site is dedicated to those who voluntarily desire to learn more about the wonderful American Serbian Orthodox heritage, responsibly empowering them to go on and pass their knowledge on to others. It celebrates, shares and sustains the vitality of the Serbs (artistry/empathy/inventiveness/big-picture thinking, the American principle of self-determination) for present and future generations. It promotes the continuity of a culture that has enriched America not only with material wealth, but more importantly, good values. Respect. Honor. Integrity. Importance of Education are but a few. Fr. Dragomir Tuba and the children of St. Archangel Michael parish on St. Sava's Day (Jan.27), Akron, OH , turning the Slavski Kolach, which they celebrated Sunday, January 31, 2010. Fr. Tuba and his family are now in the St. Sava Serbian Orthodox Church in Phoexnix, Arizona. and the Power of Perseverance, the ability to overcome adversities through pride & principles. Imagination, Inspiration, and Enthusiasm for what they believe in. The question was asked of me: "Why is St. Sava on the front page of your website? 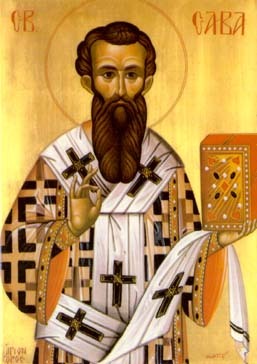 Because St. Sava was the TEACHER and ENLIGHTENER of his Serbian people. Because of Sveti Sava, we have something VERY special, our "Svetosavlje!" "Give up everything for Christ, But Christ for Nothing!" S'tobom slave slavu, Svetog oca Savu. Da slavimo slavu, Svetitelja Savu. Al' ne spali slave, niti spomen Save. The allies then bombed it in 1944 on April 16th (Paskha Day-ORTHODOX EASTER!) and the 17th (Easter MOnday) trying to rid the Germans out of Belgrade. The latest bombing took place as we all know from March 24, 1999 through June 5, 1999 which included Paskha (Easter), April 11, 1999. And people wonder why the Serbs are so obsessed with history. To enlarge all, photos, click on lower right hand corner of image. 5. Pet vekova Srbin je u ropstvu camio, Svetitelja Save ime je slavio. Da zivimo svi u slozi, Sveti Savo Ti pomozi. Pocuj glas svog roda, srpskoga naroda. O dicnoga slavlja, Oche Svetosavlja. V.Rev. Zivojin Jakovljevic , then of St. Sava's Cathedral in Parma (Cleveland, OH) and now in New York City, NY, stands directly in front of the site where St. Sava was born, lovingly called "Misici," Serbia. This WWI silk pillowcase shows Serbia and Montenegro were with the ALLIES during that time period. Unfortunately, the Serbs' undying loyalty to America was shamefully betrayed by men and countries who should have known better. God bless Serbs, loyal American allies! The Decani Monastery in Kosovo is under heavy guard because the world knows that the treasures INSIDE the Monastery are priceless heirlooms to the World! Right inside this church is found the Nemanjic Family Tree history, one of the greatest frescoes ever made! On this spot, in this church, they held the Serbian National Sabor in the 12th Century! The very same church is where St. Sava was Christened! Bell that was in use during St. Sava's times. "Sve vishnjem se molim Bogu, da nam daje ljubav, slogo. Da se brat sa bratom miri, da se Srpski jezik shiri, da slavimo Srpsku slavu, to nam zeli Svetitelja Savu!" "I pray with all of my heart that God grants us love and togetherness; that brother with brother makes peace; that we keep alive our Serbian language, that we honor our Saints Day; that's what St. Sava wishes for us." Sta Volim? I Love St. Sava’s Day! 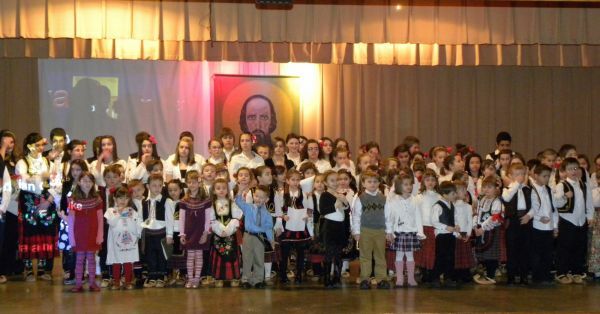 There are beautiful photos of St. Sava’s Day being celebrated by our Serbian children in Kosovo on the KIM website. Even more unbelievable, is seeing the children in Johannsburg, South Africa, ALSO celebrating St. Sava’s Day. I’m sure my favorite holiday is St. Sava’s Day. I eagerly look forward to the January 27 celebration as much as any young child waiting to open gifts on Christmas Day. My heart pumps doubly fast when I hear the first notes of “U--s--klik-ni-mo s’ljubavu….”and by the time of the last verse that talks about “and we children on this side of the Ocean, of Serbian name and blood,” I’m just somewhere else in my own universe. I revel in hearing the children say their declamaticas (Serbian recitations) to calls of “Bravo! Bravo!” perhaps coupled with shrill whistles, and hard and fast clapping. Of course, this all follows the last line of poetry said, when nervous parents and grandparents can finally breathe again and join the rest of us in the congregational celebration to Saint Sava. The thirty-two children who took the stage at St. Elijah’s Center in Aliquippa gave an inspiring, flawless performance, thanks to the persistent efforts of Protinica Ana, Fr. 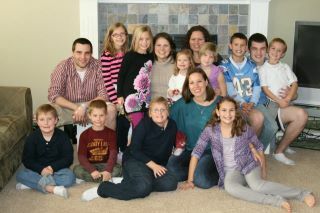 Stevan Stepanov, the Sunday School teachers, the children and their parents and grandparents. Good-natured hoots of approval revealed the listeners’awe after long poems were recited in perfect Serbian diction. 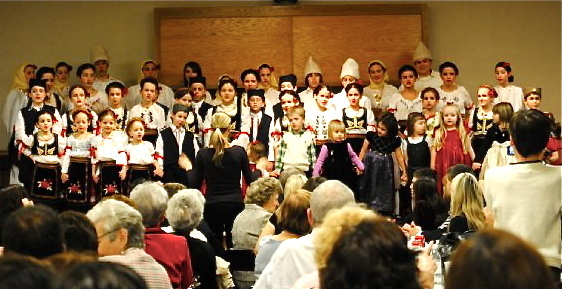 Although the St. Sava’s Day performance was after church on Sunday, January 29, the practicing started in November, right after Thanksgiving. Those extra practices on the weekdays were worth it. No more last minute stuttering over declamaticas or saying one or two lines in English. These great-grandchildren of St. Sava were absolutely wonderful! Paragraph after paragraph this old poem went on, audience eyes darting from the poised young man on the right to the equally confident young lady to our left. Three paragraphs, four. So far so good. Flawless, flawless so far. Then you could almost see the audience’s breathing almost stop half way through, probably every mind thinking, “It’s so good, I hope they don’t forget now.” Six, seven, eight paragraphs and still they went on. Now by this time you could hear a pin drop. Hearts stopped like dead battery clocks. “Keep going, keep going” I heard my mind whisper pathetically. Then finally the end, where the two teenagers said the poem’s last stanzas so dramatically together that heartfelt bursts of appreciative cheers rocked St. Elijah’s Center. 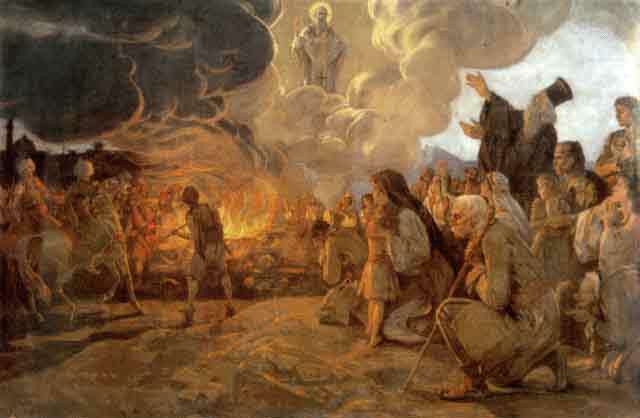 I couldn’t help but think how proud St. Sava must have been, witnessing this heavenly joy brought home to the people here on Earth! Afterwards, I thought people would head for home in droves, but almost everyone stayed for beautiful fellowship dinner afterwards, even with threats of snow. What could be better than the above? How about St. Sava’s Day celebrations two weeks in a row, and with a visit from Bishop Artemije from Kosovo thrown into the mix! In deference to Fr. Malich’s personal Slava of St. Peter in Chains on Sunday, January 29, and the possibility of an unexpected but most-welcomed guest, the Monroeville congregation celebrated the following Sunday, February 5. While I’m very partial to Aliquippa’s St. Elijah’s heavenly choir, I couldn’t help but be delighted with Monroeville’s St. Nicholas Choir too as they sang with such gusto under the direction of the master, Milutin Lazich. Um-umm! What fantastic voices answered the prayers of the many participants in the altar, led by Bishop Artemije! The Sunday School children sang “Uskliknimo,” and “O Boze Nas” and “Krst je sila i za mene, krst je spasenje…” as the congregation went up for nafora before the choir continued singing….what else? “Uskliknimo” all the way to the end! Even though it was Super Bowl Sunday, the church hall was packed for a wonderful dinner. 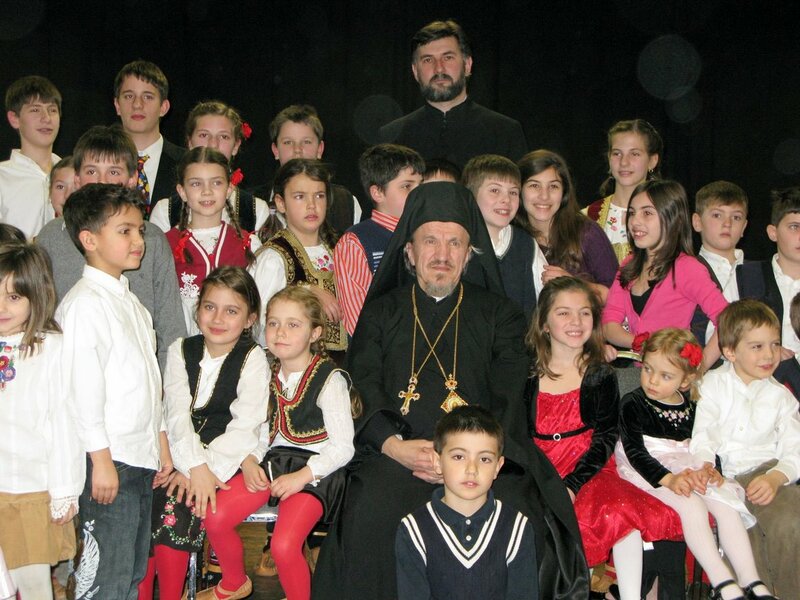 Bishop Artemije told of watching the children in Kosovo give their speeches for St. Sava’s Day, and never dreaming he would be lucky enough to be halfway across the world, to hear recitations to St. Sava again in America. 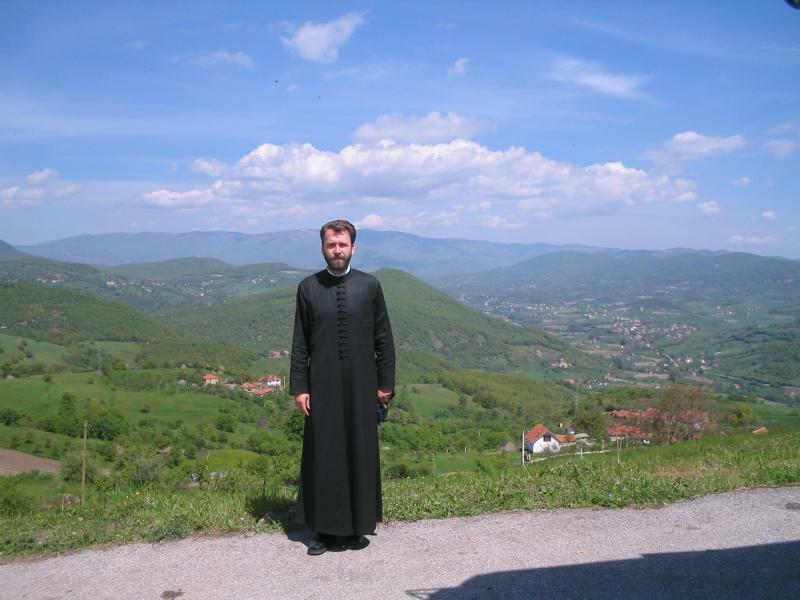 Then he spoke of the extremely hard times faced by the Serbian people of Kosovo and Fr. 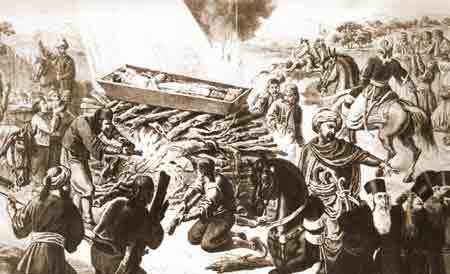 Malich as always, urged the people present to give as much as they could to help our suffering Serbian brethren. Sitting right next to Georgeann Klipa, I couldn’t help but see that she, not a wealthy woman by any means, lovingly answered Fr. Malich’s call, emptying her checkbook, but filling her heart. And this wasn’t the first time. If all of us could follow examples like the Klipas and the Silianoffs and others, our poor Serbian people wouldn’t be in such dire straits. Who else do they have to help them but us? Congratulations, Monroeville. You are very generous givers! Bishop Artemije stayed to watch most of the 62 young children recite poems, sing Bible songs, act in plays and do a Question and Answer session about the Life of St. Sava. This time, the Master of Ceremonies was none other than George Klipa, following in the footsteps of his late father, +Steve Klipa, who was posthumously awarded the medal of St. Sava for all of the good deeds he did for his people by V.Rev. Dr. Bishop Mitrofan of the Eastern American Diocese. George was absolutely perfect, sometimes bending down on his knees and congratulating every participant so each thought of himself worthy of a star in a Hollywood sidewalk. As they walked down the stairs, they received gifts from the honored Kumovi Robert and Diane Ray and their children. While ALL the children were again delightful, special mention must be made of (1) Judy and Ivan Obrknez’s two youngsters, Evdokia & Vaso, singing (belting out with all their hearts!) about Serbia: “Bices si ti, sto si bila!” to the delight of the crowd, (2) the handsome young Karas boy, four year old Dushan, son of Paul and Tracy Karas, when he said without missing a word, and delivering it as if he were in TV Broadcasting school at college, the entire NICENE CREED. Joi, joi, joi! The joy that day in Monroeville. The future is assured! That’s right, St. Sava. Your children on this side of the ocean, of Serbian name and blood, will, Daj Boze, continue to sing to you with joyful hearts. They’ll do their best for you and for themselves, making us all proud. Just like their parents, grandparents, and great-great grandparents, they’re wonderful Serbs. And in being good Serbs, they’re even better Americans! O guide of Orthodoxy and blessed teacher of virtues,* purifier and enlightener of thy homeland,* beauty of monastics,* most wise Father, Holy Sava,* by thy teaching thou didst enlighten thy people,* O flute of the Spirit, pray to Christ God for our souls. As the first great hierarch and co-worker with the Apostles,* the Church of thy people magnifies thee;* and since thou hast found favor with Christ,* save us by thy prayers from every calamity,* so that we may proclaim to thee: Rejoice, God-wise Father Sava. Have you heard about the St. Sava School in Milwaukee, WI? Visit their church there too! Fr. Jakovljevic writes: "The Irish in America are very proud of their identity. They proudly wear their national costumes, decorate their homes and themselves with green, and play their national music. They faithfully observe St. Patrick's Day as their naitonal holiday and almost all of us Americans join them in the celebraton. Jews and other national and ethnic groups in America also proudly preserve their national identities, cultural heritages, languages and religions. We Orthodox faithful need to preserve and cherish our Orthodox Faith unaltered." Let us sing with love to our St. Sava, Serbian churches and schools, glorify his holiness! Wherever our St. Sava is, there are wreaths and glory, Sing to him, thrice! These BEAUTIFUL children from Kansas City know all the words to St. Sava's Hymn, "Uskliknimo" and sang it for me while their parents were performing for the 67th SSF Festival in Aliquippa, PA! 2008. They were in Joliet for 2009, and Chicago's "One Love" too, in 2010! These kids could make ANY heart happy! And, they're young TEENAGERS now! Here's another song young American Serbs like to sing at picnics and other happy gatherings. This song shows Serbs are proud of their Serbian Orthodox heritage: Thank you, Mother, for what you've given me! Truth, Freedom in my heart; Karadjordje and Voyvoda Stepa! Kids in Phoenix waving their little Serbian flags! Photo from Denise K.
Display at the B.F. Jones Memorial Library in Aliquippa, in honor of the 67th Serbian Singing Festival held in the area Memorial Day weekend-May 23-25, 2008. This is the Nemanjic Royal Family Tree from which St. Sava's family originated. It is located in the Decani Monastery in Kosovo! There is a similar fresco in the narthex of the Patriarchate of Pec from the fourth decade of the 14th Century. This is our history! This is our future! We must always be vigilant in defending Kosovo for those who come after us. Here I am lighting this candle in Decani Monastery in the name of all of the Serb National Federation members living and dead in America, who always defended Kosovo through the 19th, 20th, and 21st centuries!. These children from Serbia were on a field trip with their teachers to this Lazarica Monastery. Fr. Zivojin (from Cleveland) and I purchased candles for them to light for all the martyrs who died throughout the centuries. Then we all sang "Vjecnaja Pamjat" (Memory Eternal) and "Uskliknimo" together. Here are some other Serbian teen-agers who are just like you, and their teachers at another Serbian monument. It seemed everywhere we visited, school children were out learning more about their country's historical sites! We made sure we told the students how very much we loved them all... each one of them! These children BLESSED themselves before singing "Uskliknimo" for us! Wherever our St. Sava is, there are wreaths of glory! We loved them! Look at THESE children singing "Uskliknimo" in the St. Sava VRACAR Cathedral in Belgrade. They were on a field trip from Voyvodina schools, 2006. 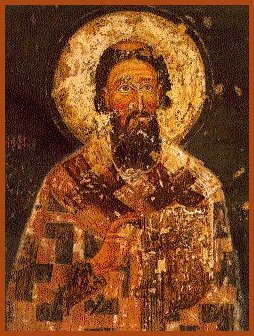 “Ko to lupa?” Who knocks on our heart on St. Sava’s Day each year the way Prince Rastko (our beloved St. Sava) knocked on monastery doors centuries ago? In Aliquippa, PA, one could say it started this year watching ever reliable Bisa Kovachevich and her daughters Stephanie and Nada proudly bringing the Kolach and Koljivo up the steps of St. Elijah as the bells were joyfully pealing, calling the faithful to service. Peering down from the choir loft, admiring honored Kumovi, Natalie Suder and Alex Osman, standing so upright, wearing their red/blue/white trobojnicas, holding aloft their special candles throughout the service with a pride not unlike that found in the finest of Serbian soldier flag bearers, counted as another joy. Capturing with your eyes the Click! Click! Click! mental snapshots of a dozen gold-clad altar boys in absolute synch doing formations in front of the altar or left altar door with their silver and gold crosses, fans, and candle holders, better than any star football players making X’s and O’s moves on a chalkboard made it 3-0. It’s your inside alertness alarm going off, with the promise of “coming soon!” ---the hustle, bustling preparation of the distinguished tutors huddling around the small altar table, bringing the wine, kolach, koljivo, then giving the hand wave signal to the waiting Sunday School class representatives; the Kumovi passing their candles to the back so their hands are free to turn the kolach with Father. Ko to lupa? (Who's knocking?) It’s St. Elijah’s balanced and strong 35 member choir singing “Slava tebi Hriste Boze” (we celebrate You, Lord God), as the kolach is turned, and after all is said and done, a chorus of joyous “Mnogaja Ljeta” (“Many Years!”) and singing verse after verse of “Uskliknimo” as the well-pleased parishioners go up for nafora. All this even before the first Declamatcia (Recitation) is said! Not only the parents and grandparents got kudos, but also the dedicated Sunday School Teachers and Program Coordinators, Georgette Osman and Brian Hayden. The Mother’s Club with Seya Mabee and Lynn Popovich at the head had everyone thanking them for a wonderful dinner afterwards. From Juliana Mistovich’s flawless recitation of “Dobrodoslica” (Welcome) to endearing Elijah Kosanovich’s “Eto Dragi Gosti Mili” (Here we are, Dear Guests! ), a big “thank you!” for a job very well done! St. Sava himself would have been so proud! Special mention should be made of “Ostajte Ovdje!” (Stay Here in Serbia) a poem by Aleksa Santic performed flawlessly by Natasha Cvjetkovic. Update 2010: Natasha graduated from Hopewell High School and was the recipient of TWO academic scholarships! Here is the Poem RASTKO (WHO IS KNOCKING?) written by Vojislav Ilic that has been translated for us by V.Rev. Fr. Dr. Mateja Matejic! Sharing knowledge this way, Fr. Matejic knows that one of you out there reading this might be the one to VOLUNTEER to say the poem at YOUR CHURCH next St. Sava's Day. Start practicing now! Thank you, Fr. Matejic! This is wonderful! a cry pierced, and they awoke. and my body needs repose. to my country and its freedom. Heavy gates were slowly opened. like a lost and lonely soul. stood outside in the snow. His face was pale like an icon. Unkempt hair his head protected. on his forehead was reflected. on his forehead a kiss implanted. and many more will yet flow. deathless, as it is his story. SAINT SAVA, clad in glory. 2009 St. Sava's Day Celebration at St. Elijah's Serbian Orthodox Church, Aliquippa, on Jan. 25, 2009. Celebration with V. Rev. Fr. Adam Yontich filling in for Fr. Stevan Stepanov. Brother & Sister, Alex & Jessica Osman were Honored Kumovi. the words so you can learn it too! You can be sure they all said poems to St. Sava! And how about the St. Sava Church in Indiana's Web Blog? Read about it here! We love the folks at St. Sava's in Schererville and Merrillville areas! Read, but don't forget to come back! Congratulations to Fr. Dejan Tiosavljevic and his faithful parishioners of St. Sava's Serbian Orthodox Church in Cypress (Houston), Texas, 77429, with the Consecration their new church on Nov. 12 and 13, 2011, with 5 Bishops and many clergy being present. It was a grand day for all. Congratulations, St. Sava Houston! Greetings arrived from Prince Aleksandar of Serbia and his family; Governor Rick Perry of Texas, U.S. Senator John Cornyn, and United States Senator Kay Bailey Hutchinson. Kum for the occasion was Jonathan Stigant, Ktitor-Builder. Go back to the top of the page for other selections! These links and the ones on the following pages are being provided as a convenience and for informational purposes only; they do not constitute an endorsement or an approval by the webmaster of any of the products, services or opinions of the corporation or organization or individual. The owner bears no responsibility for the accuracy, legality or content of the external site or for that of subsequent links.